The large backyard with wonderful views of the mountain is great for family gatherings, BBQ’s, backyard cricket, football or just relaxing. It is a few minutes walk to the lake and its many walking tracks. Or you can use any one of the 4 bikes to explore the local area. And its just a 5 minute drive into town. Therefore you are ensured of taking advantage of the wonders and natural beauty of Wanaka. Dogs are welcome outside in the backyard or the double garage. 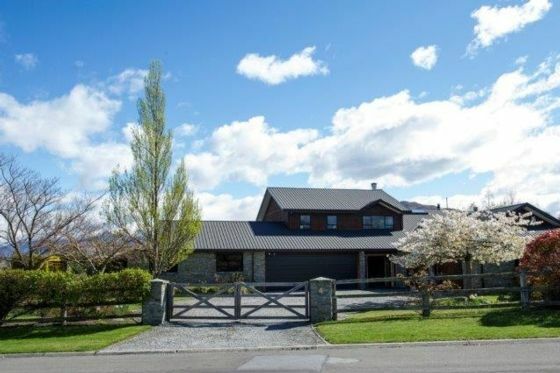 This newly furnished family and pet friendly holiday home is located in one of the best streets in Wanaka that is perfect for both ski and summer lakeside holidays. Dogs allowed outside in the backyard or the double garage. Please consider the couple in the Granny flat. Any dogs that stay are to be cleaned up after. What's not to love? Views to die for, space, beautiful gardens, lovely street, close to town, great bikes. Property was beyond our expectations. Spacious, clean, well-equipped. Already planning the next trip back. Thanks so much. Absolutely outstanding property - faultless. Absolutely outstanding property - faultless. Massive, spacious, great location, awesome quality bikes and helmets, small details provided were great (e.g. coffee capsules, soaps etc). Great communal areas, fantastic location, excellent for a weekend away! Spacious house with great outdoor area and well looked after garden. Spacious house with great outdoor area and well looked after garden. Very handy location in an exclusive neighbourhood. Would definitely stay here again.